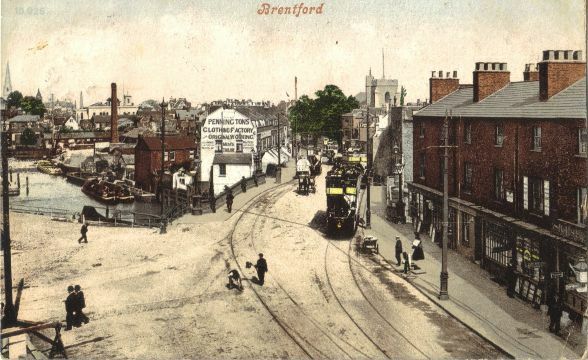 This tinted postcard was postmarked Ealing W. 5.30pm February 12 1906 and was taken from the railway bridge across London Road, looking east towards the High Street which starts on the far side of the bridge. St Lawrence's church tower is visible right of centre, St Paul's spire has been picked out far left and there is another tower to the right of the tall brick chimney (too far away to be St George's?). Pennington's Clothing Factory is prominently advertised on the building end. The same building has a banner on its front, local history publications show this was advertising Pennington's jubilee in 1904, suggesting the image dates from 1904-1906. The scene shows people going about their business, open top trams heading towards the recently widened bridge. The brick terraces nearest the photographer are numbers 1-11 London Road. No. 11 was the Northumberland Arms, the name 'Sichs', the Chiswick Brewery can be made out. There is a view of the same properties taken from a different vantage point, c. 1913 and this page includes links to other images of this area. A check of the 1911 census confirms there was (and is) a Hamstead Road in Handsworth, but no 'Oakdale' has been indexed. I have not looked for Miss Willis. Information about High Street properties to the left, including Penningtons.